IBF featherweight world champion Lee Selby says he has the option of some huge fights - if he can overcome American Eric Hunter. Selby, 29, makes the second defence of the title he won in May last year at London's O2 Arena on Saturday. "There have been some great fighters calling me out," he said. "But I've got to come through this one first." Hunter, also 29, insists he will beat Selby and has accused the Welshman of "running away". 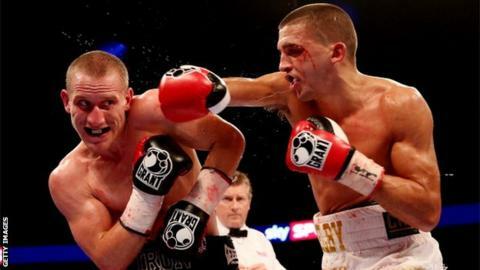 Selby first became world champion by beating Evgeny Gradovich of Russia in May 2015, then was successful in his first defence against Mexican Fernando Montiel in Phoenix, Arizona in October. "Carl Frampton was talking about me after his last fight, Josh Warrington has called me out a lot of times and Leo Santa Cruz has mentioned me too," he said. "Warrington will never get to my level. He's done everything asked of him and won all the titles I vacated and it's a fight that could be made straight away if he comes through his next fight and I come through mine." Hunter, who is fighting outside the United States for the first time, expects to be the aggressor when he and Selby meet in the ring. "He's a runner, we know he's a runner, he boxes and runs away," he said. "Not to be smart or cocky, but I'd never heard of him until the Gradovich fight - and I think Gradovich was winning but Selby got the hometown decision. "He boxed well. He runs pretty well too." Selby, whose partner has just given birth to their second daughter, believes his dedication will give him the edge in London. "I am not like other fighters, I don't go out celebrating after a win," he told BBC Wales Sport. "I'll be straight back in the gym after I have beaten Hunter. "I have two young daughters and it makes you think more. "My life is different as a world champion - I am recognised more - but it hasn't changed me as a person."